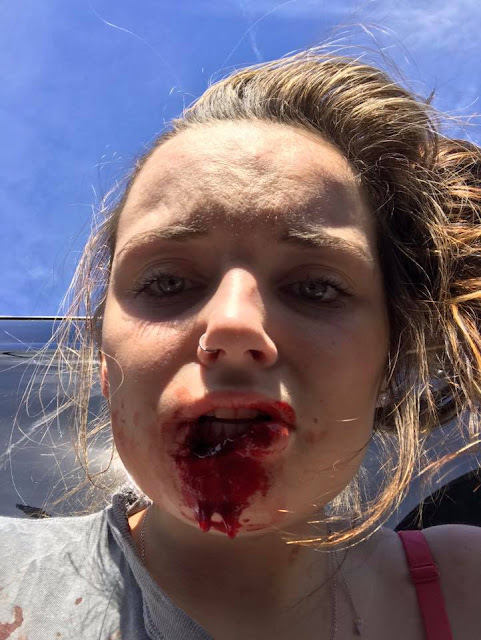 A domestic abuse survivor has shared her story after years of suffering in silence. 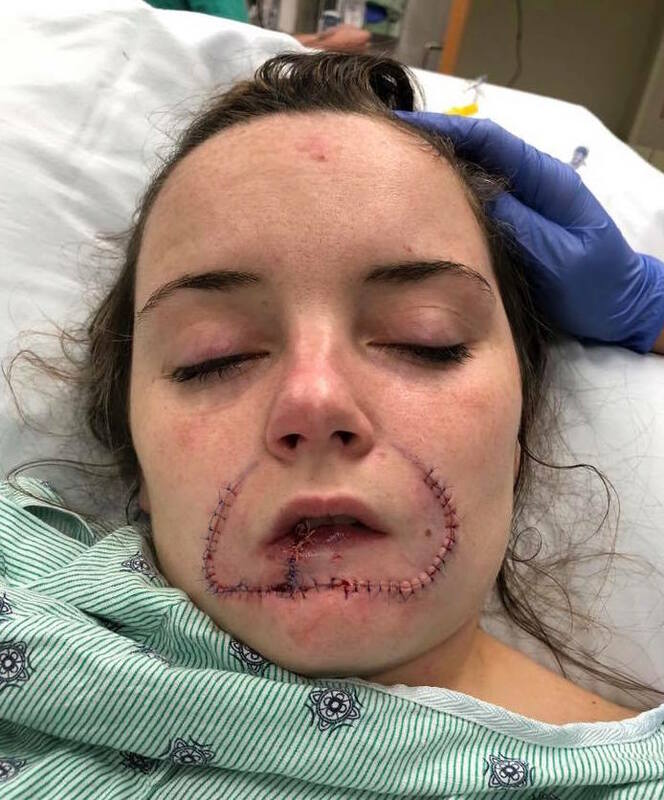 Kayla Hayes took to Facebook to narrate the gory incident that led to her boyfriend, Seth Aaron Fleury, bitting off her lip after she told him she wasn't interested in working things out with him. "This was the day that a piece of me died. " I remember every detail of this very moment, the thoughts that ran through my mind when I opened my camera, were very dark which only seemed to worsen. 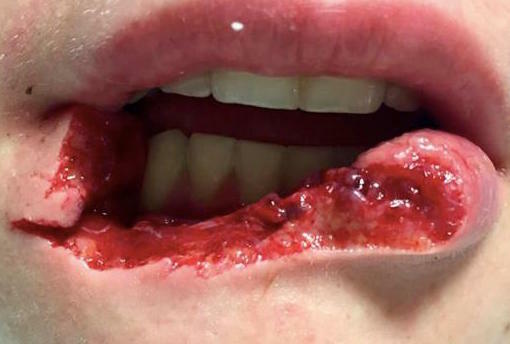 Sitting in a puddle of my own blood with the majority of my lip laying on my leg, my whole mouth on fire, confused and terrified, I didn’t know how I could ever show my face again. At that point, honestly wishing that those very seconds would just be my last- I wanted to give up for good. I kept replaying what had just happened in my head, from telling Seth that I was not there to get back together with him, however I was there for him to right his wrongs. To getting flowers and cards thrown at the back of my head and then quickly get in my car to seeing my leg shaking uncontrollably to finally look up at him picking everything up. I could not figure out how this happened so fast. I couldn’t figure out how he was so mad. From putting the items in the passenger seat leading to him trying to kiss me. Of course, as I said before, I wasn’t there to get back together with him. I refused and backed up only to feeling him latch on to me. Feeling it tear about half way. I then just started screaming at the top of my lungs for help and out of fear for my life. He then yanked me out of my own vehicle and slammed the door in my face so he could take off, and run away from what he had just done. He continued to call me once I made it into the ambulance, which felt like a life time after having something many women hold precious to them, completely mutilated. I just don’t understand how you could be filled with such anger.. I remember the look of terror on the mans face that just so happened to save my life this day. As well as the sweet elderly lady that had to walk out of her home to see such tragedy occurring but yet was so kind to try to help me and keep me comforted until further help arrived. I remember Officer R coming around the back of the vehicle with Officer P following. I remember Officer R pulling his walkie talkie over to speak in to it. 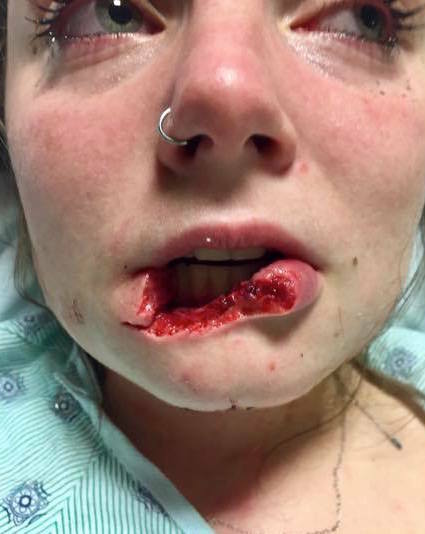 Saying something along the lines of it being more serious than what he was expecting, my lip being completely severed off and for the EMS to come quick. Then giving me a piece of gauze and trying to assist me to stay calm and find out the details. I remember being in the ambulance, being told to call my mother. I couldn’t bring myself to do it. She was seven hours away on her first vacation she had ever taken without me, how could I ruin it. 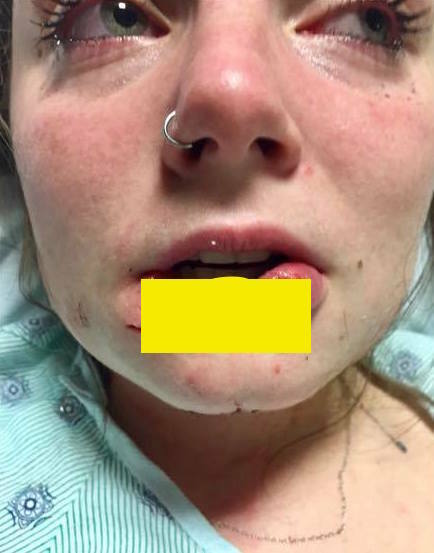 I then got on the phone with her friend and I remember trying to say he bit me but no one could understand me because my lips couldn’t pronounce it.. I then blew up into a ball of emotions and gave the phone to the lady behind me, allowing her to explain. I remember just watching out of the back of the window of the EMS, watching the roads thinking we were never going to make it to the hospital, again wishing that these moments would just be my last. Still to this day I cannot hear or see an ambulance without going into a panic. It brings me right back into this moment. Seth has been charged and sentenced to 12 years imprisonment.